The idea of establishing a statewide organization of Chicanos in higher education originated in September 1974, with the Chicano Faculty Association of the University of Texas at Austin. Professors Teresa H. Escobedo, Efraim Armendariz, and Leonard A. Valverde wrote a proposal that was funded by the National Education Task Force de La Raza, Southwest Regional Office, then directed by José Cárdenas. At a February 1975 Education of Mexican Americans conference held in Austin and sponsored by the Chicano Faculty Association, the Mexican American School Board Members Association, the Texas Association of Mexican American Educators, and the Texas Association for Bilingual Education, a steering committee was selected to plan and implement the association. Out of over 700 Chicanos in professional staff positions in higher education in Texas identified by the steering committee, 156 attended the Mexican Americans in Higher Education Conference held in San Antonio, where the constitution was approved on August 9, 1975. Today, past presidents are encouraged to continue to serve TACHE in an advisory board capacity. This is done to ensure TACHE not only preserves its past, but that it remains current, strong and a formidable player in the higher education arena and matters of policy impacting Chicanos and the community at-large. TACHE is a professional association committed to the improvement of educational and employment opportunities for Chicanos in higher education. 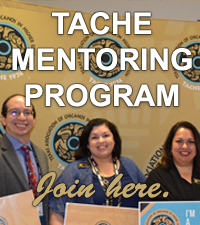 TACHE's purpose is to provide state, regional, and local forums for the discussion of issues related to Chicanos in higher education and to collaborate with institutions of higher learning to create workable solutions for these issues. Educational Advocacy: To articulate educational problems, needs, and issues related to Chicanos in higher education. To engage actively in building networks with local, state and national organizations for the purpose of securing changes in laws and policies detrimental to our constituencies. To assist in establishing effective institutional programs and communications to recruit and retain Chicano students, faculty, and administrators in higher education. To assist in the promotion of the history and culture of Chicanos for educational and public information purposes. TACHE invites you to join our family of educators today.